Nomura Holdings made a call today on oil prices. It made me throw up in my mouth. This kind of sensationalism is incendiary. 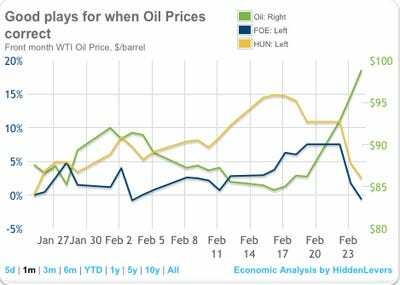 Yes oil is going up a bit on the turmoil in the Middle East. It did touch $100usd, and might trade through it momentarily, but $220? Seriously? In my rants on the Libya situation (see part I and part II), I covered the past spats in god’s country, when oil had a gain of 150% (1980 Iran revolution) and 100% (1990 Gulf War). A $220 call on Oil is right in the middle there, about a 125% gain from its price around $98. “If Libya and Algeria were to halt oil production together, prices could peak above $220 a barrel and OPEC spare capacity will be reduced to 2.1 million barrels a day, similar to levels seen during the Gulf war and when prices hit $147 in 2008.” – Nomura Holdings. Nomura’s economic research team conflates this conflict-related spike during a downturn with the artificial bubble pricing of summer 2008. As I have said before, that’s a nicht-nicht. But Nomura is quite premature in that call, and especially in its articulation of how we get there: Libya and Algeria falling. 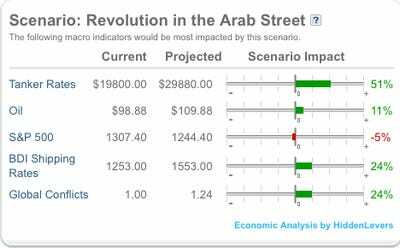 A deeper look shows Nomura mentioning Libya and Algeria halting production as the paths to their lofty $220 call. Remember though, Libya is a non-factor in the greater scheme, and even Nomura admits that without the Algeria sideshow, the rise in oil from Libya is at $110. The real deal, which I have written about previously, is Saudi Arabia. The fact that Nomura buries that info deep into its $220 commentary, along with the Saudi no-mention, make Nomura’s agenda in the $220 Oil call suspect. But seeing as this scenario is mostly baked in, and Saudi social control is in effect, it may be a good idea to find some plays that would do well once you see Oil prices touch the $110-ish mark and head back down. I used the HiddenLevers screener to find those more quickly, using Oil as the lever to find inversely correlated investments. Two stood out, Ferro Corporation (FOE), and Huntsman Corporation (HUN).